D has been travelling (driving) back and fro from the West of Scotland to Essex the past few weeks. He is away again to be with his mother. I have found that I have become rather lazy just cooking for myself, in fact early in the week I came home only to make myself some oven baked chips with beans, the day before that I re-heated a couple of autumnal fritters and slapped them in between a crusty bread roll and on one evening, I even had a bowl of muesli. He will be mift with me if he finds out about my eating habits. So I picked up a bag of bag of baby spinach, silly really as I still have some Swiss chard growing in the garden. I picked them as I knew they would wilt quickly and turn to mush if not used. This would motivate me, if not encourage me to make something with them, as I totally dislike wasting fresh veg. Well, it worked. After coming in from work yesterday, I made a rather healthy looking 'Spiced Quinoa salad with chickpeas and mango chutney' to redeem myself from the past few days of eating 'on the hoof'. I've eaten and cooked with quinoa before and I found it just okay, whereas D was no keen on it at all. So its not an ingredient I cook with often, but with D being away, I though this would be a good opportunity to be re-introduced to it again. It would also be a good challenge to come up with a recipe that would appeal to me. This Spiced Quinoa salad wasn't too time-consuming to put together either. Once the quinoa was cooked it was about adding all the other simple ingredients. It was pretty effortless, even the baby spinach wilted with the gentle heat and there it was - a light bright nutty flavoured meal. This is my entry for this month's No Croutons Required (NCR). NCR is a monthly food blogging event where readers are challenged to create either a soup of salad using a particular ingredient that is suitable for vegetarians. NCR is alternately hosted between the lovely Jacqueline of Tinned Tomatoes and Lisa of Lisa's Kitchen, who is this months host. The theme for November is create either a salad or a soup featuring Quinoa. Measure out the quinoa in a measuring jug. Rinse it in cold water in a sieve. Boil the quinoa in water in a saucepan under a lid at low heat for 10 minutes, remove from the heat, add salt and chilli flakes. Leave the saucepan with the lid on for 10 minutes or a little longer until all the water has been absorbed and the grain is soft and loose. 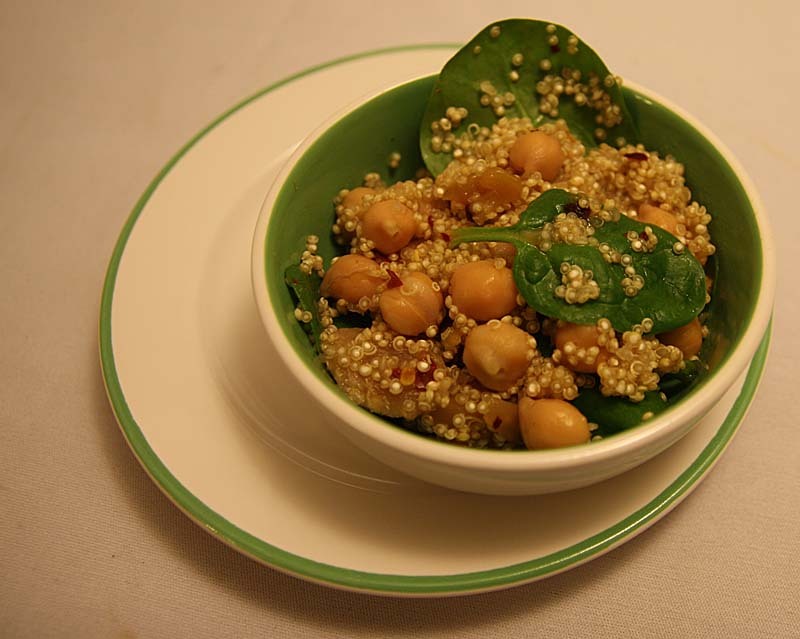 Gently stir in the chickpeas, mango chutney and baby spinach. What a lovely looking salad, something to brighten the mood on a wet & windy day! I love the look of quinoa, and the odd, bouncy texture it has when cooked. I emailed the chutney recipe to you, hope it reached you safely! This looks excellent, not too time consuming and healthy for you. Will your Swiss chard make it through the winter in Scotland? I love eating chickpeas. Sometimes I think I am going to turn into a chickpea, because I eat so many. I think this is a good salad for a wet and windy day! Oh what are we like, when our significant others are away :( We should treat ourselves when they are away too and not be lazy. I too shall try to make more of an effort and ease of the potato chips, if you ease of the toasts! My Swiss chard is looking good at the moment. I should harvest it really. It tends to do okay with frost, its the snow that gets it - so I am okay for another month I think (fingers crossed), weather is so unpredictable. It has been rather icy here. Breakfast for dinner - I gues we are allowed to break the rules now and again, esp. when alone. I like your idea fo rusing this recipe inside an omlette, it would make more of a meal of it for sure. Although I have been going chutney, jam and jelly making crazy the past few weeks, mango chutney is not one i have made. The one I used came from the farmers market. Sorry. This looks good--I've never cooked quinoa before but happen to have some sitting in my pantry from when a friend came into town and cooked for us. Thanks for the idea of how to use it! Am here from Sophies blog and must agree with her on ur wonderful space!! Oh this salad is sooo good!! Thanks so much for your entry. A lovely dish indeed. Thank you so much for coming by Sugar Plum Fairy, and for the lovely compliment. Thank you. I'm lookign forward to seeing the other submissions. This sounds great, I love mango and am happy if I can get it to go with more dishes. Also, always looking for more quinoa dishes. i just don't use quinoa enough! this looks quite tasting and a nice and proper meal! Hope you make this and enjoy. I'll be making some more Quinoa dishes in the v. near future as i want to make sure I use up the packet and not discover it in a years time, gone past its sell by date, so please do come back and check out the other recipes. It was a nice light meal. So glad I came accross your blog, thanks to sophie Phoodofiles. I live in the west of Scotland too and you are the first person I have ever met here that likes to grow her own veg. Very encouraging indeed!! Thank you for your kind words regarding the loss of my father-in-law. I am glad that D can be with his mother at this time, its just such a shame we live so far. Thank you for coming by Sarah and for your lovely words. Please do come back! You w ill be mad emost welcome. 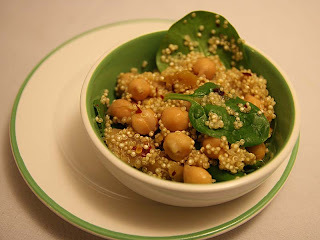 Great idea of combining chick peas and quinoa - two of my foodie loves (I too wonder if I'll turn into a chickpea from eating too many of them). I really like quinoa (and love that I can grow it ok too)and have even tried it as a 'porridge' - with water and apple juice in the mornings - makes a nice change. I also use quinoa to make a nice cucumber raita, with yogurt and mint. Hah ha - Ferris Jay. I too sometimes I think i'll turn into a chickpea, if not a potato! I don't dislke quinoa, just have to learn to like it more. I have got a recipe for it as porridge,s o will try that one of these days. But I have to admit, I am esp. liking the sound of the cucumber raita qunioa. I certainly will give that a go and I am sure my husband will like it disguised this way too. So thanks for sharing that. Thanks for your condolences.